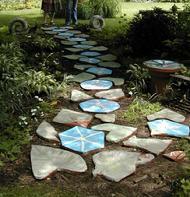 Stepping stones come in a variety of styles and colors, all hand painted and hand finished. Sizes are 12" square and 10" and 12" round, 1" thick. The glaze is painted onto the wet clay prior to firing. Then during firing, the colors become fused to the stones, like a "skin," ensuring that they will not fade. The stones are frostproof and fadeproof in all climates. A unique concept in individual patio design for residential and commercial patio and walkway areas. The basic concept involves the use of decorated and undecorated tile that can be combined in countless configurations to make individualized areas. Each tile is hand cut and decorated, creating a delightfully charming appearance. The squared tiles fit a one-foot grid. The circle tiles are 10" in diameter. All 10" stepping stones above will fit with the surround tiles.